I'm going to use a lull in my travel for The Great Mistake to start clearing my post backlog, starting with a response to the most recent review, by the sociologist Andrew Perrin. His piece is at the public sociology blog Scatterplot, and, among its other virtues, it offers the most sustained engagement on research costs (Stage 2 of the book's decline cycle) that I've received. I posted a comment on his post and crosspost it here. His skeptical analysis of the emphasis I place on research costs is essential reading. It advances the kind of debate whose general absence has helped dumb down university policy. I'm very grateful to him for the intelligence and energy that went into his analysis. This blog has covered research costs many times ("How Can Public Universities Pay for Research?" "UCLA Loses LONI: Why Budget Silence is Bad for Science," "UCSD and the Crisis in Public University Research Funding," etc.) In The Great Mistake I go into the problem in detail, and also, in the final chapter, suggest a way of solving the core research cost problem without needing new money. After one talk this winter, someone asked me, "are you arguing that the way we fund research is the public research university's Achilles' heel"? "I wish," I replied. "That was just one small though important body part that didn't get protected in the River Styx, so you could armor it and be ok. Our research funding model is more like a tragic flaw. It is a secret weakness that cannot be separated from a great strength--unless it stops being a secret and is brought to light." 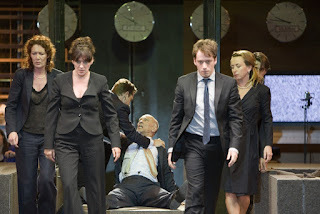 As I was later watching Toneelgroep Amsterdam's great 6 hour sequence of three Shakespeare plays, Roman Tragedies, I wondered, is the public university like Coriolanus, returned a military hero but unwilling to work with the newly empowered plebeians in the Senate, and so destroyed? Or like Marcus Junius Brutus the Younger, picking the wrong political allies, with the same result? Or Mark Anthony, losing the civil war to Octavian by ignoring his own strategists, who assured him he could not win at sea but must fight on land? Overkill, perhaps. Start by reading Andrew Perrin. Many thanks for the thought and intelligence that went into this review. I agree with the criticism of UC-centrism. I’d like to assemble a research group to do comparative state studies of university policies, or at least work with other people on this. We’re getting a better picture through a series of books that focus on the systems the authors know from the inside. Austerity Blues looks at New York, to take just one other example. Jeff Williams and I would love to publish more work on various state systems in our Critical University Studies series. As you say, North Carolina is a crucial case. On research funding, let me first take a step back. The book argues that treating universities as private goods has lowered their social value and hurt their finances. Many defenders of any given instance of privatization either deny social or educational costs or say they are less than the life-saving benefits of the new revenue streams. My examples question these life-saving revenue benefits, which in many cases are actually negative. Universities always generate value even when they lose money on something like extramural research or small-scale teaching. But policymakers shouldn’t support a practice—privatization—that doesn’t correctly do the one thing it is supposed to be good at, which is provide net financial benefits (gains that aren’t created by losses elsewhere in the institution). Other broad points. Technically, the contrast I draw is between high-research and high-teaching fields, where fields with lots of extramural funding have high gross revenues but lose money when overhead costs are netted out, and fields with essentially no extramural research but lots of enrollments are able to run surpluses—surpluses that administrators must use to cover losses elsewhere. The fact that these kinds of departments polarize into STEM and non-STEM is contingent on other historical problems that I’m trying to help address. Also, I am pro-STEM and hate the STEM/SASH divide. I spent not the happiest years of my professional life as a co-founder of an NSF center trying to overcome it. I see the divide as an artifact of a two-cultures ideology that has produced fundamentally different—even mutually incomprehensible-- material conditions of research. The grant scramble in STEM feels to me to be inhumane and even anti-intellectual. I think it’s getting worse all the time, and I have nothing but sympathy and admiration for the colleagues who work 80 hours every week while skipping weekends for months at a time to keep their labs running and students funded. I take their plight as seriously as I take that of SASH scholars. And yet I also see political inequality between STEM and SASH that is supported by budgetary opacity. Designated makers always beat takers in America, and my hope is that showing the makers are also takers (we all are both) will create a more open and less biased policy arena and fairer, more effective outcomes. A side benefit, which I don’t do much with in the book, would be redress for the structural poverty of qualitative and interpretative research, for which I don’t see any ethical or intellectual justification. Since I advocate a wholesale public good model for universities, I am pro-subsidy. I am also pro cross-subsidy. I don’t mind some Sociology enrollment income winding up in Electrical Engineering to pay for accounting staff. In terms of what you call external funds, my view, which goes beyond that of Walter McMahon and other economists I cite, is that the general public should pay all the costs of public universities, in the full knowledge that some returns will go only to the student they subsidized in the form of private market benefits (a salary increment), while most returns are nonmarket, indirect, and social, and fan out incalculably into the society, as we want them to. In “internal” terms, we all need to help each other out. If running one chemistry hood costs as much as running the lights and computers in 35 sociology offices, then sociology coughs up for chemistry. The reverse should also be true. The problem with this situation is not that these subsidies, which are called cross-subsidies, are inherently wrong. To the contrary, these subsidies are commonplace and justified by the public benefits of research results. They are also justified by the private benefit to the student of attending research-intensive universities. At these institutions, students work with faculty who are at the forefront of their part of the knowledge world. They have access to the research process, which helps them to develop creative capabilities sooner rather than later. One can argue that the public and the student receive more benefit from an education in which instructional funding subsidizes research in the same environment. Though the costs can and should be separated so we can see who is paying for what and how much, the cross-subsidy is completely legitimate in principle—as long as it is acknowledged and shared in an equitable way. The last sentence is the issue for me: not that we have cross-subsidies, but that we hide them. This removes them from the realm of policy and shared governance, and even correct accounting. After a few silly anecdotes about scientists prevented from buying printer paper on their grants (do English professors not need printer paper? ), Newfield then relies on NSF and university budget data to claim that between 9% and 20% of universities’ outlays for research are uncompensated by federal funders, so must be made up by institutional funds. These funds, he claims, often amount to nearly 100% of institutional research expenditures, which leaves 0% for institutional support of SASH and other research that doesn’t attract extramural funding. I agree the anecdotes are silly. The point is that research accounting rules set up Catch-22s: some are silly, and others which blow holes in universities budgets. I also break down the range of 9-20% into three models all of which are justified by different sections of research funding reports based on the same data. The differences reflect not only the ambiguity of semi-official interpretations of federal data, but also unequal budgetary situations for different kinds of universities. We need much more—and much more open—research to have a more complete picture of what is going on. There’s a lot of forensic accounting going on here, and I think Newfield makes untenable assumptions to reach those high numbers (20% unfunded, 100% of institutional outlays). Most important here is the accounting for what universities pay for research that is not extramurally funded. Lots of that is implicit; professors spend their time, paid by university funds, on research and scholarly inquiry all the time. They do it with computers, office supplies, and sometimes dedicated funds that don’t count as research expenditures but are university resources spent on research and scholarly activity. I’m not sure what you mean by untenable assumptions, but I assume you mean the omission of a portion of tenure-track faculty salaries and benefits as university’s internal funding of research. I mention this omission in a footnote (middle of p 363, and also see the following note), and my reason is that this applies to all research professors in all disciplines, and is part of what one must do for one’s basic salary. Put differently, it would increase both the total amount of institutional funds spent on research and the total amount of research expenditure, so it wouldn’t change the share. If anything, counting part of salary and benefits would have helped my inequality case, since disciplines that expect extramural grants for tenure, promotion, etc. generally require about half as much teaching as those that don’t. In any case, I could better acknowledge that research universities do invest in all faculty in this way, especially since I am personally very grateful for that. Next you write, “Throughout the section on extramural funding, Newfield implies that universities would not be doing the research if it weren’t for that funding.” I’m agnostic on this. Your counterfactuals are interesting, but I don’t think they affect my argument. It’s true that universities paying 20% of research is better than them paying 100%. But paying 0% is better than paying 20% when general operating money per student has never recovered to the levels that the research enterprise assumed, and when students are progressively taking over from taxpayers in supporting it. 20% or 50% fro institutional funds would be fine with me were research funded at adequately high levels and as a public good, such that subsidies (including those from students as private individuals) are no longer extracted, left acknowledged, and not reimbursed. I tried to address this point above. his greater claim that in fact the English department is subsidizing STEM is based on treating institutional funds in two conflicting ways. When they pay for English salaries and overhead, they are treated as external income from tuition and state funds: fees paid for English professors’ work. But when they pay for STEM salaries and overhead, they are treated as internal funds. Newfield is right to call out the PR machine’s implication that STEM pays for itself and English doesn’t, but he’s wrong to interpret this as an internal subsidy. That account masks a much bigger problem with reliance on external funding: its intellectual costs. Funding rates are already very low, and today’s “skinny budget” contains draconian cuts to those low budgets. All that means that scientists will be spending more of their time trying in vain to attain funding instead of doing science. (Grant applications are the beginnings of science, yes — but only when high-quality applications are likely to be funded.) Furthermore, the bottleneck by which such an enormous majority of science is funded by just a few agencies raises the prospect of an intellectual monoculture; heterodox inquiry is unlikely to flourish under such concentration. I think it would be better for science and for SASH disciplines for universities to find ways to fund more research across the disciplines internally. I hope my account doesn’t mask this problem, even if it doesn’t analyze it. I also hope my account helps the discussion you call for by shining a light on how we spend institutional funds now, precisely so we can imagine spending them differently. In general, I agree with you that the agency funding situation poses major intellectual problems. These are important and longstanding. Clark Kerr described federal granting agencies as having created a “putting-out system” that made universities dependent subcontractors with borderline sweatshop conditions, and that was during the golden age of federal granting growth in the late 1950s and early 1960s. More internal funding would help with this quite a bit. Projects could be developed in collaboration between faculty and their offices of research, and consortia could be created bottom-up to share costs across universities. It would be helpful to draw up some questions and projects that can’t get funded in the current system but that could under this alternative. The drawback of course is that universities would need to quadruple their research funds to cover what we currently fund today, which still wouldn’t be enough, either for STEM or for SASH disciplines. I’d like to see a cultural shift that would allow the public to trust universities and their associated professionals enough to do that, but that’s a long road. In any case, many thanks again for your very helpful and insightful analysis. The most visible item on this week’s University of California Regents agenda has the Board considering a cap on the enrollment of non resident students. It appears towards the end of the second month of a Trump administration that has not dampened enthusiasm for debt-free college or free college but increased it. 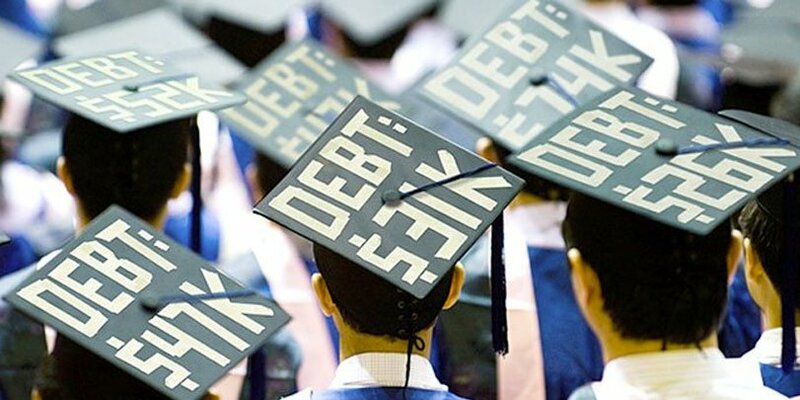 Democrats in California, New York, and elsewhere are proposing debt-free plans and are weighing tuition-free as well ("Degrees Not Debt," "The $48 Fix"). In January, the California Legislative Analyst's Office published a report calculating the costs of debt-free college degrees in the state's public systems. When I extended their arithmetic for UC, it showed that UC could be debt-free for less than 10% of its current tuition income. That would be an amazing thing. It would change what the public thinks universities can do for them. But the UC Regents are talking about a different tuition issue this week. In California, nonresident (NR) enrollment was a ticking political time bomb that finally went off a year ago, when the State Auditor released a report finding, to quote its title, “The University of California: Its Admissions and Financial Decisions Have Disadvantaged California Resident Students.” The UCOP rebuttal didn’t appease the legislature, which translated the angry denunciations of some members into a proposal that nonresident undergraduates be capped at 10% of overall UC undergraduate enrollment. UC’s response is to propose an overall UC cap at twice that level, or 20% of undergrad enrollment. The proposal grandfathers the three campuses that are now above that cap at their current levels (Berkeley at 24.4%, UCSD and UCLA nearly tied at just under 23%). It lets other campuses grow their NR student enrollment to the point that the overall university level, now 16.5%, reaches 20%. The advantage for UC is that it can continue to grow overall nonresident supplemental tuition (NRST) revenues (which bring $26,682 in tuition on top of the $13,500 state-resident tuition and campus fees that NR students also pay). The disadvantage for UC is that this flies in the face of legislative desire, which is that NR enrollments stop growing and start getting cut back. Sometime this week, the Regents' proposal was downgraded to a discussion item, so that even this modest proposal will not be up for a vote. I’m going to focus on aspects of one issue: does NRST actually work as public income replacement? NRST is a prime example of privatization, since it partially replaces public funding—state general funds—with high tuition from individual students and their families. Privatization advocates have two main arguments. First, they say they didn’t “replace” public with private funding, since the public funding was already cut and they needed to fill a gap. Second, in the case of NRST, the tuition money comes with low costs, and the benefits are always far greater than these costs. This year, both UCOP and Senate leaders are also stressing the blessings of diversity as uniquely offered by NR students. UC may have started privatizing reactively, but now seems to say that private funding is as good or better than public funding, at least in the case of NRST, which is per student $26,682 better than public funding. But is NRST in fact an example of privatization bringing both fun and profit? When I first wrote about it in September 2009, I calculated that its financial benefits were overstated: senior officials announced gross income figures that didn’t deduct expenses or real non-monetary costs like the political goodwill required to maintain state funding. I called NRST one of the “nickel solutions” that can get to a 5% (or some other single-digit share) increase in a vulnerable revenue stream but not beyond that. I was using Robert Birgeneau’s plan to do what in fact has happened—ramp up the nonresident share of UC Berkeley’s undergraduate enrollment to about 25% of the total. Then-chancellor Birgeneau projected an increase of tuition revenues to $70 million at 25% NR enrollment. In response, I estimated the benefit to the UC Berkeley budget had it already achieved a 25% share of NR students: 8% of full instructional expenditures as I calculated them, and 4% of overall campus expenditures. Hence the nickel. UCSD professor of marine chemistry Andrew Dickson—and fellow UCPB vet—used a different methodology to come up with a similar estimate. Both of us emphasized hidden or indirect costs of adding NR students. These included new instructional and student support needs. They included the price of political resentment and backlash from the public and the legislature, which would appear in the concrete budget effect of either cuts or reduced public funding increases over the long term as the University proved once again that it didn’t need so much public money because it had so much private money, including tuition from that semi-infinite supply of international students who were joining a billion-strong global middle class allegedly hungering for an American BA. This blog's NRST analyses suggested three worrisome features of UC advocacy. UC calculates the financial benefits as a gross income, not as a net. Indirect and nonmonetary costs (like political goodwill or student work hours) aren’t analyzed publicly. It denies or deems temporary the anti-public aspects of the move. UC officials were then suggesting that NR enrollment would last only as long as the budget cuts and could be dialed back as soon as possible. When someone does put political costs on the agenda, senior officials define them as effectively zero. The same goes for the costs to public funding. I have again recently had a face-to-face experience with a senior UC official who declared the feedback loop from private back to public to be nonexistent. In this view, UC’s continuous and successful efforts to increase private revenues never have and do not now teach politicians that they can cut state funds without hurting the University. In contrast, my research for The Great Mistake found statements going back to 1970 that inferred legislative obligations from tuition hikes. For me, the question is not whether tuition hikes dampen state funding increases but how much? How much public money do tuition hikes cost? My answer in 2009 was more than the 8% of your instructional budget or 4% of your campus budget reaped via expanded NRT. With only 4% annual GF increases and a tuition freeze following deep cuts, the UC system has been losing more than 8% a year compared to its structural needs (e.g., Displays 5 and 6; discussion of this “New Normal”). What’s happened since? The state cut public funding and still hasn’t built it back. The University raised tuition and then the governor forced a freeze. The University ramped up nonresident enrollment, such that UC now has about 5 times the number of NR students that it had ten years ago. As in any social system, these elements of the funding model are interconnected. Then, about ten years after the growth began, the State Auditor issued its report, and the political blowback began. UCOP responded in three ways. It posted a rebuttal that insisted the University has continued to admit all eligible resident students, rejecting the state’s claim that NR enrollments damaged access. It emphasized the pre-existing plan (page 8) to admit an additional 10,000 resident students, in spite of below-cost per-student funding from the state. And now, the regents will have a discussion of an NR cap that allows further NR growth at the non-flagship campuses up to an overall system total of 20 percent. 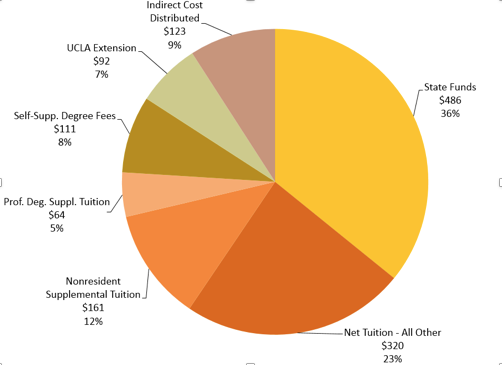 You can see the surface appeal of nonresident tuition from this UCLA budget slide, referring to $1.4 billion in core campus revenues in 2015-16. NRST was 12% of the campus's core revenues, or over half the total tuition the campus gets from resident tuition. Given limits on the growth of state funding and resident tuition, NRST is no longer a temporary alternative revenue stream but a significant part of the overall budget. At least from the administrative perspective, Premise 2 above--NRST's temporary nature--is moot. But remember that these are gross revenues. Let's look at NRST net income, and switch back to Berkeley to compare the 2009 calculations to the actual situation at nearly 25% nonresident enrollment. Like all campuses, UC Berkeley grosses $40,182 per NR undergrad. We subtract gross in-state tuition of $13,500, since the campus would get this anyway with a resident student. (The University normally takes one-third of gross in-state tuition as “return to aid” to support financial aid programs, but NR students also pay this on the in-state tuition "base.") UC Berkeley thus receives $26,682 for replacing a resident student with a nonresident student, or for adding a nonresident student rather than adding a resident student. Then, we encounter another subtraction. Undergrads who are residents of California also bring state general funding with them. This is the amount that has been cut so much over the decades--it is down from $19,100 in 1990-91 to $7,160 (in 2016-17 dollars, Display 3). But $7160 is far from zero. In the case when a nonresident student replaces a resident student, we subtract $7160. The net after deducting direct costs or losses for this kind of NR student, who replaces a resident, is $9522. Hmm. If we posit that UC Berkeley decided not to add unfunded resident students and not to overcrowd its facilities, so that all nonresident students replaced a resident they might have taken were the state paying for them, we multiply this figure back by UC Berkeley's 7335 nonresident enrollments. In that case, we get a net NRST for the campus of $69,844,000. This is freakishly close to Robert Birgeneau's 2009 estimate of $70,000,000. More importantly, it is under 10% of the campus's gross tuition revenues. It is just under 4% of the campus's 2015 operating revenues. In short, NRST remains the nickel solution that it seemed to be in 2009. A rebuttal to this analysis would object that its premise is wrong: UC Berkeley added resident students as well so NR students didn't simply replace them; the state wasn't paying for many of the resident students so there wasn't that $7160 difference to subtract; or it was paying $5000 instead. I agree that we would get different numbers if we changed the proportion of NR added to NR replacing residents and plugged in the state's shortchanging. There is a range of reasonable estimates of the NRST net. But they wouldn't increase the NRST totals enough, net of direct monetary cost, to justify making NRST a central and irreplaceable tuition strategy. That's my first conclusion. There's a price to the privatization of revenue streams, and it needs to be netted out. Other indirect costs are costs to academic quality. This is a taboo subject in a University that is now engaged in a permanent campaign to fundraise from everybody, but the problem continues eight years after the crisis. This year, to compensate an angry legislature for NRST, UC enrolled the largest one-year number of new residential students in living memory. Campuses are handling the “surge”--on top of the continued growth of non-residents--with strategies like hiring non tenure track rather than tenure track faculty, growing course sizes, and endorsing short-cuts such as having some undergraduate work be graded by other undergrads. How do we quantify this cost of tuition-suppressed public funding--which may follow our graduates into their working lives--so that state government cares about it? There are still other costs I will merely name. One is the public cost to national higher education as states race each other to swap students so they ca triple charge them. The Department of Education should confront this absurd escalation of overall national tuition charges, which drives some share of student debt, though even under Obama it did not. Another other is the loss of political goodwill. This is hard to put a number on, but "The $48 Fix" calculated that UC is at least $3 billion in general funding below where it would be had it simply grown with the state from 2000 on (Table 1). Clearly not all of this gap can be traced to tuition hikes. But the annual state funding shortfall is 5 or 6 times larger than even the gross NRST revenue figure for the system-- to say nothing of the net. We should do a few things going forward. Faculty should support the Senate's call that UCOP not just give the state an NRST cap (page 8), but call on it to buy out the NSRT--and set a wider precedent for restored public support. We need to recognize that the three premises I mentioned above don't hold. We must see nonresident enrollment through a calculation of its net revenues that includes its indirect, political, and social costs. This means we must face the fact that when we include the cost to public support of the educational core, privatization is a money loser. This leads to the only viable alternative, a public-good model for the university that supports debt-free college,and a $48 Fix. The same goes for research as well as teaching. Research funding and graduate education have also been destabilized by the private-revenue model. I'd ask faculty skeptics who think "multiple revenue streams" is the only way to keep Berkeley and other UC research on top: Are you better off today than you were 8 years ago, when we started to ramp NRST up?